If you need any help, or have any general questions about us use our contact form below. View our MuzicNotez Magazine if you would like to see our MuzicNotez newsfeed and updates. 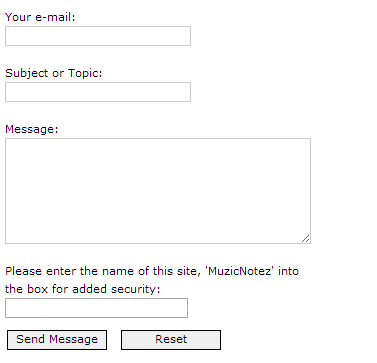 If you or your company have an interest in advertising on MuzicNotez, contact us directly. For specific abuse issues contact us. Your security is of the up most importance to us at MuzicNotez to create the best experience possible for you. Please do not give out any of your personal credit card information throughout our website. We do not insure any type of break in confidentiality including identity theft. Please be safe when submitting your information online, we care about your safety and want you to be aware of our concern.